The Zodiac Sign Capricorn Man (December 22 - January 20), Capricorn Personality Traits for Male born under December Zodiac signs. This person always tries to keep a low profile, his inner world, desires and intentions are unknown, and this becomes attractive and even frightening for some people. Contrary to popular belief, the Capricorn man does not like loneliness, he likes to go out, he just never takes a central position as a leader, and tries never to attract attention. But the representative of this zodiacal constellation always finds it interesting to manipulate people from his hiding place in such a way that none of them will suspect that they are being controlled by such a shy and timid Capricorn man. Capricorn man is a very pleasant man, his intelligent and aristocratic manners make him a welcome guest in any self-respecting company of people. The representative of this zodiacal constellation is always afraid of pressure on him, he cannot admit that someone penetrates his inner world, penetrate who wants to put his order there, or, conversely, ruffle things, and therefore hides behind the mask of indifference and coldness. Fire always burns inside his mind, and people who got to know him better, can say with certainty that he is very passionate, has a hot nature, skillful, can be offended, and have fun like a child. Secretly, Capricorn is an unusual romanticist and inspired dreamer, he loves to travel and likes to have fun. Capricorn can often tell jokes in the public, but they are ironic, sometimes - with a hint of malevolent, but there is nothing from the real Capricorn man, which is locked in Capricorn's mind - mask. Externally, the Capricorn man tries not to show his emotions, he always looks cold and aloof, and this creates a view of him as a cold-blooded and even callous man. A representative of this zodiacal constellation will never go too far in his imagination, he prefers to settle for small dreams that can be easily actualized and achieved in real life. Capricorn man does not like showing his feelings because of fear of being weak and irresolute, but therefore even with a loved one in public, he sometimes appear cold and even rude. He cannot be changed. He is a conservative to the marrow, and even in clothing, the Capricorn man tries to stick to classical and low-key style, and sometimes prefers older and stressed cut stuff. He is skeptical of comments made by other people to him. He does not care what people around say about him, whether they praise or scold him. But after compliments, the Capricorn man is illuminated by new ideas and inspiration, and this proves the fact that he after all does not neglect praises made to him. Capricorn man becomes wiser with age, he opens up with time, getting rid of many inferiority complexes, and in adulthood may show a completely open cheerful man who knows how to tell a joke and make a compliment. Capricorn man loves his family and will do everything he can to keep his family altar intact. He can flirt with other women, but will never be tested on family ties, because he is always afraid to lose them. He has a lot of demands for his future woman, but of particular significant to him are such qualities of his partner as attentiveness and kindness, diligence, ability to keep the house and cook well, look good, have intelligence, education and wisdom. Female beauty for a Capricorn man - is a relative term, he believes any woman who is independent in outlook and has extensive knowledge in all spheres of life is beautiful. 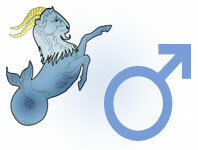 Full description of Capricorn Man, character traits and personality characteristic for male Capricorn.